As I Lay Dying is an American metalcore band from San Diego, California. Founded in 2000 by their vocalist Tim Lambesis and having completed their first Line-up in 2001, the band consists of vocalist Tim Lambesis, drummer Jordan Mancino, lead guitarist Nick Hipa, rhythm guitarist Phil Sgrosso, and bassist Josh Gilbert, all of whom are Christians. Signed to Metal Blade Records, As I Lay Dying has released five studio albums, one split album, and two compilation albums. As I Lay Dying's fourth studio album, An Ocean Between Us peaked at number 8 on the Billboard 200, and number 1 on the Top Rock chart. The band has performed at Wacken Open Air, With Full Force, Soundwave Festival, Sounds of the Underground, Warped Tour, Bloodstock Open Air and Taste of Chaos. In 2007, As I Lay Dying won the "Ultimate Metal God" award from MTV2 at the first annual "All That Rocks" special, was named "Artist of the Year" at the San Diego Music Awards in 2008 and was nominated for a 2008 Grammy Award for the song "Nothing Left". Their latest album, The Powerless Rise was written over a three year period and was released in May 2010 to widespread critical acclaim. After leaving the band Society's Finest where he played guitar, vocalist Tim Lambesis formed As I Lay Dying in 2000.Starting out as a duet with drummer Jordan Mancino after they first met as a band in February 2001, the title of the band was taken from the novel of the same name by William Faulkner although there is no correlation between the band's musical theme to the theme of the novel. Pluto Records took interest and offered As I Lay Dying a recording contract. After accepting the offer, one month later the band entered the studio to record their first album Beneath the Encasing of Ashes, which was released in June 2001. In 2002. The band recorded five songs for a split album through Pluto Records, with San Diego heavy metal band American Tragedy. As I Lay Dying realized it needed to expand to a five-piece to include another guitarist and a bassist. Mancino commented "we started going on tour and we needed obviously more people than that." Since they had no "solid" members besides Tim Lambesis and Jordan Mancino, the band recruited friends to perform with them and from there on the group encountered several line-up changes; bassist Noah Chase departed from band in 2001, Brandon Hayes and his subsequent replacement Aaron Kennedy departed in 2003; soon after forming the band The Tokyo Smash in Tulsa, Oklahoma. In July 2003, the band's second studio album, Frail Words Collapse was released. Produced by Lambesis, the album peaked at number 30 onBillboard's Independent Albums chart, and number 41 on the Top Heatseekers chart. William York of Allmusic thought the band "doesn't really add anything new to the mix from a musical standpoint" with the release, although praised it for being "solid enough and well executed, and the production is adequate." Sherwin Frias of Jesus Freak Hideout had similar sentiments and commented "As I Lay Dying didn't exactly break many boundaries in making this record", but praised that each song is "executed so well (and with such precision) that nary a song misses its target." Touring followed to promote the album with the bands Himsa, Shadows Fall, The Black Dahlia Murder, Killswitch Engage, In Flames, Sworn Enemy, and Hatebreed. Music videos for the songs ?94 Hours? and "Forever received rotation on networks such as Fuse and MTV2's Headbanger's Ball. As I Lay Dying entered Big Fish recording studio in Encinitas, California in January 2005 to record their third studio album. Shadows Are Security was released in June, and debuted at number 1 on the Independent Albums. It was the band's first release to enter the Billboard 200 at number 35. and sold about 275 000 copies. Wade Kergan of Allmusic called it "one of the strongest releases of 2005," and commented that new guitarists Phil Sgrosso and Nick Hipa, make the band "stronger." Rod Smith of Decibel Magazine commented "Tim Lambesis' finely honed roar in bittersweet instrumental matrices augmented by occasional clean vocals by bassist Clint Norris. Guitarists Phil Sgrosso and Nick Hipa whip up a melodic cyclone on 'The Darkest Nights'." Guitarist Evan White had quit the band due to personal reasons after his mother had died. All the clean vocals were sung by Dave Arthur of Kings to You, because they sounded more powerful in the studio than Clint Norris'. In 2007, As I Lay Dying started recording a new album titled An Ocean Between Us, which was released on August 21, 2007. Debuting at number 8 on the Billboard 200, and number 1 on the Top Rock chart with first-week sales of 39,000, the album was the highest charting release for the band. Co-produced by Killswitch Engage guitarist Adam Dutkiewicz and As I Lay Dying, and mixed by Colin Richardson, the album received generally positive reviews. 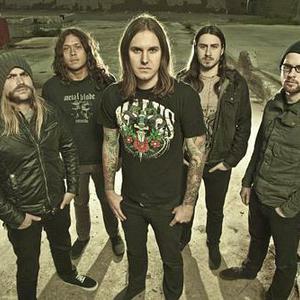 Christa L. Titus of Billboard commented "Whatever the differences between As I Lay Dying's personal desires and what its fans demand, this album surely acts as a bridge," praising the song "Comfort Betrays" for its guitar solo. Scott Alisoglu of Blabbermouth.net described the album as "a well-rounded and often thrashy metalcore album, as the band has struck an effective balance between aggression and accessible melodies." Thom Jurek of Allmusic praised the band for expanding its musical range by including melodic choruses and clean vocals such as they had previously done on Confined from Shadows Are Security. It was the first time for bassist Josh Gilbert to be featured on an As I Lay Dying record since the time of the departure of previous bassists, Evan White and Clint Norris. On September 28, 2009, As I Lay Dying announced that 6?7 songs had already been written for their then upcoming album, which followed onward to November 23 where Josh Gilbert announced through Twitter that half of the record was recorded. As I Lay Dying announced the title of their new album The Powerless Rise. On May 7, The Powerless Rise was posted in its entirety through MySpace Music. The streaming lasted until May 10. The album was officially released on May 11, 2010 and received generally positive critical acclaim, with one critic saying "Fans of metalcore in general, and As I Lay Dying in particular, will be more than satisfied with The Powerless Rise, as the band's gradual progression and consistency makes this their best album." As of January 2012, As I Lay Dying have been in the studio with producer Bill Stevenson (NOFX, Rise Against, Anti Flag) working on material for a sixth album, expected for release later in the year.